"You're eating what off a truck?" a friend asked when I told him I would be sampling the wares at The Lobsta Truck (@lobstatruck). There's nothing like seafood -- tricky to source, expensive and prone to spoilage -- to fortify or chip way at one's prejudices about food trucks. If there's an identity struggle to define what kind of food is served on trucks vs. what is served at a "real restaurants," lobster is its Waterloo. 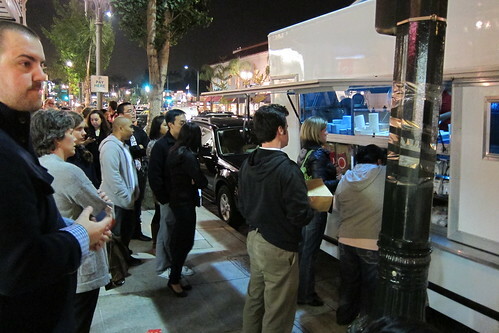 Set to officially launch on December 3rd at First Friday in Venice, the still unmarked Lobsta Truck held a friends-and-family preview in Pasadena on Friday night. The menu is simple. There's New England clam chowder, bags of Cape Cod potato chips and whoopee pies by Baking Whoopee. But the reason to come to The Lobsta Truck is in its name: lobster rolls ($11) and crab rolls ($9) served with mayonnaise or melted butter. I sampled only the "Connecticut-style" version (i.e. with melted butter). I like lobster. Why insult it with mayo? The lobster roll is minimalist in execution; no chopped celery or other geegaws in the dressing. Served on toasted split-top rolls (hot dog buns that went to finishing school), the steamed lobster meat under its mantle of warm butter is sweet and succulent, not at all rubbery and has a fresh taste. It helps that Lobsta Truck proprietor Justin Mi worked for a seafood distributor. The 26-year-old South Pasadena native plans to only use fresh, unfrozen seafood. "We get it shipped by air cargo probably two or three times per week. It comes from Massachusetts, Maine and even further north," Mi says. $11 is steep for food truck fare, but the roll is a fair size and half the price of the lobster roll at Hungry Cat, probably the best known iteration of the dish in Los Angeles -- and Mi knows it. "There aren't many sit-down restaurants that carry lobster rolls in L.A.," he says. "It is a lot more expensive to go to a sit-down restaurant and have a lobster roll. I definitely think we represent a better value proposition for customers."